Accessories: Accompanied by Patek Philippe Certificate of Origin Stamped by Kuwait Patek Philippe boutique and dated September 19, 2012, additional bracelet links, setting pin, product literature, leather document holder, fitted wooden presentation box and outer packaging. Patek Philippe was the first manufacturer to introduce the annual calendar complication, offering a mid-tier option between the relatively simple triple calendar and the highly complicated perpetual one. The complication appeared first in 1996 with reference 5035 - and successive iterations - featuring a Calatrava style case and a 36mm case diameter. In 2006, exactly ten years after the first appearance of the complication, reference 5396 marked the introduction of a second annual calendar dress watch option in the company lineup. An example of the understated elegance Patek Philippe is known for, the model heavily borrows design elements from one of the great classics of Patek Philippe production: perpetual calendar reference 3448 (and its later sibling ref. 3450). The dial design is nearly identical, with two windows for day and month at 12 o’ clock, a subsidiary dial at 6 o’ clock, and an overall very minimal and clean dial design without any scale. The case also features the same polished sloped bezel of the vintage model. Some differences with ref. 3448/3450 are the presence of a date window and the introduction of the 24 hours indication dial-wise, and different lugs design case-wise. Reference 5396 first appeared in 2006, in white or pink gold. The present variation (blue dial, bracelet) was introduced in 2012 and this is only the second example to ever appear on the market. 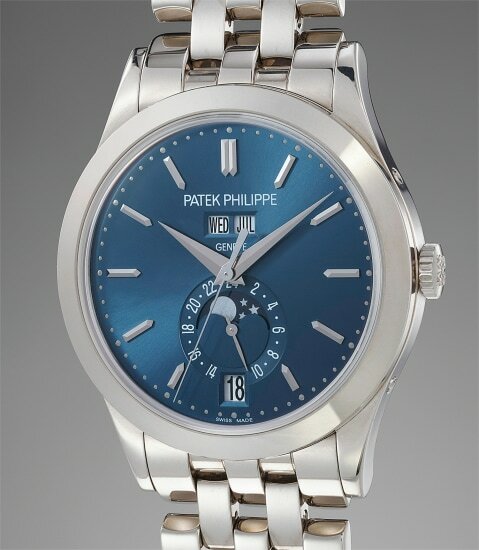 Offered in practically new-old-stock condition from its original owner, this bracelet, blue dial ref. 5396 will endlessly please its new custodian with its exquisite proportions and allure.